Composition provides an emotional outlet for me, and a way to express the timbral sounds conceived by my imagination. Peter McNamara is an award-winning Sydney-based composer gaining a reputation as one of Australia's most talented and innovative emerging voices. Born and educated in Sydney's Western suburbs, his work is particularly influenced by landscapes and the physics of the natural world and universe, and extends across a wide variety of musical genres including orchestral, chamber, electronic, installation and film composition. Between 1999 and 2011 he studied at the Sydney Conservatorium of Music with composers such as Michael Smetanin, Bozidar Kos and Trevor Pearce, graduating with a PhD. He is currently an academic lecturer at the Sydney Conservatorium of Music, the Excelsia College in Sydney and a co-artistic director of the Sideband Collective. McNamara's works have appeared at numerous international events including the 2008, 2010 and 2013 ISCM World New Music Days and the 2008, 2009 and 2011 Gaudeamus Music Weeks in the Netherlands, performed by leading international orchestras and ensembles including Ensemble Modern, the Melbourne Symphony Orchestra, Ensemble Insomnio, Orchestra Victoria, Ensemble Nomad, Orkest de Ereprijs, Ensemble Offspring, the Tokyo Sinfonietta, Ensemble Phace and the Stroma Ensemble. McNamara's work has also been commercially recorded by Australian virtuoso performers Claire Edwardes (The Styx, Kammerklang 2009) and Alicia Crossley (Duo-Generare, Duo-Blockstix 2017). He also co-initiated the commercial CD recording project Sideband with fellow composers Tristan Coelho and Brad Gill, which was released in 2014 and contains recordings of his solo works Voltage and Cadenza II. McNamara numerous awards include the 2015 APRA Professional Development Award, the Gallipoli Songs Prize in 2014 (The General's Garden), second place at the 2011 Young Composers Meeting with Orkest de Ereprijs (Cross Modifications), the 2008 2MBS-FM composition award for Orchestra (Modes of Deception), the 2007 Betty Amsden Award for Orchestra (Auftauchen der Nacht) and second place in the 2007 Asian Composers League Young Composers Awards (Landscape of Diffracted Colours). 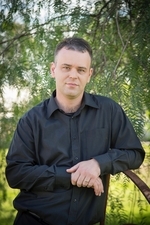 McNamara also received a High Credit from the Lepo Sumera International Composition Contest in 2003 for his orchestral work Shadows of Fallacy. Transfigured Continent : for amplified bowed cymbal, indeterminate ensemble and film (2016) Commissioned by Sideband. Amplitude : for solo percussion & pre-recorded electronics (2013) Commissioned by Brad Gill. Six dimensions of seven : for solo harp (2012) Commissioned by Ursula Caporali for the "Six Artists Seeking a Composer" Project.